Blue Bottle Coffee. Photo ©Clay McLachlan. Thursday, October 1 at 6:30 p.m.
From tens of thousands of individualistic kissaten cafes to the ongoing quality wars of convenience store brews, Japan boasts a coffee culture like no other. Now the island nation, one of the world’s largest importers of coffee, is shaping two recent trends: as an inspiration for coffee’s current third-wave and for sculptural art made from milk froth. The talk will be followed by an on-stage demonstration by 3D latte artist Kazuki Yamamoto, making his first appearance in the U.S. Yamamoto creates an average of 50 latte foam pictures and sculptures each day at his Tokyo café, from kawaii animals to impossible likenesses of comic book and anime characters. 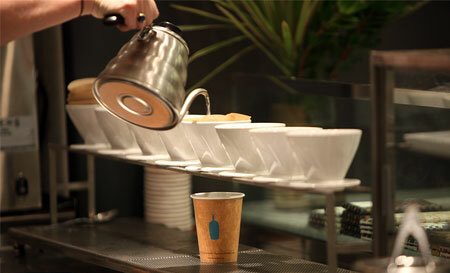 The event will be followed by a demonstration and tasting of Blue Bottle Coffee’s signature premium pour-over brew. James Freeman started Blue Bottle Coffee in a small food-potting shed in Oakland, California, in 2002. Freeman grew up in Humboldt County where he took up classical clarinet and became a freelance clarinetist in San Francisco. When he was 19, he traveled to Tokyo and loved its close-nit yet comfortable atmosphere. After being introduced to Japan’s kissaten culture, he was immediately drawn to Japan’s coffee equipment such as the Takahiro Kettle and Bonmac Dripper, which is used in Blue Bottle cafes today. Being a Japan fanatic now, James Freeman makes frequent visits to the country and has even opened up a Blue Bottle cafe in Kiyosumi, a small homely neighborhood in Tokyo. Freeman believes in the delicate crafting of brewing coffee to bring out its upmost flavor. He also believes in the unique texture and taste Blue Bottle brings out that is unchanging from each branch. He is now living in San Francisco with his son, Dashiell, and his wife, Caitlin, whom he met while working at the Berkeley farmers market. Born in 1987, Kazuki Yamamoto (also known as George) started working in a French restaurant at age 20, where he learned the fundamentals of making coffee. After the Great East Japan Earthquake and Tsunami in 2011, he began posting his latte art on social media to help take people’s minds off of the disaster. The posts were wildly popular, and after perfecting a technique creating 3D sculptures from latte foam, his artwork received international coverage on television and in magazines and resulted in the book Looks Cute! Fun to Make! 3D Latte Art (Shueisha, January 2014). In March 2015, Yamamoto opened the cafe Reissue in the Harajuku neighborhood of Tokyo, where customers can request what latte art they would like on their coffee. Daily updates of his work can be seen on his Twitter page.